Head coach Marcelo Bielsa was left disappointed by his side’s display as they suffered a fourth defeat in five games when going down 2-1 at Stoke City. Despite enjoying a 71 per cent to 29 advantage in possession the Whites did not create enough clear chances and defended poorly to allow Stoke their two goals before Ezgjan Alioski’s injury-time goal came far too late to salvage anything from a poor afternoon. 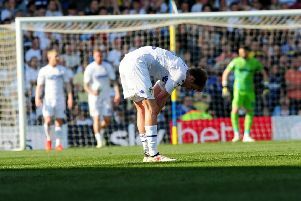 Their chances were not helped when key defender Pontus Jansson was harshly sent-off 14 minutes from time for a second yellow card offence in the eyes of referee Gavin Ward. Bielsa insisted Leeds’ defeat had nothing to do with not watching the Potters in training as he admitted he had done previously with all United’s opponents, but was more because they had not attacked well enough. The Whites boss has indicated he will stop the practice after the furore cause by the Derby County “spygate” affair and said after the Stoke game: “We can’t say we ignored the features of the opponent. We just didn’t take advantage of the possibilities we had. It was a game we could have won. “Our goal is to have good balls to attack because we usually hurt the opponent. Today we had many opportunities to attack but we didn’t hurt them. “We lacked aggression and we didn’t play deep enough to finish off the attacks. “It was a game that we could have won. That was reachable. We had the ball, we arrived easily in the last part of the pitch, but in spite of this we couldn’t arrive in the box enough. The red card for Jansson looked a bad decision as he barely touched Benik Afobe as he attempted to run clear and it was the Stoke player’s subsequent bad touch that allowed keeper Bailey Peacock-Farrell to come out to save. But true to form Bielsa would not have a go at the referee. He added: “We can’t say we win or lose because of the referee. Stoke manager Nathan Jones revealed that his team had changed tactics for the game to try to catch out Bielsa, switching to a new three at the back system. He said: “He’s well drilled on what our usual formation is so we thought we may have to give him a surprise. Bielsa did not drop any surprises in his line-up, with an unchanged side from the one that played so well against Derby in the previous game. Bailey Peacock-Farrell retained his place in goal despite the signing of Real Madrid goalkeeper Kiko Casilla earlier in the week and was one of the Whites best performers on the day. They started well with Pablo Hernandez only inches wide with a shot after just two minutes. Joe Allen forced Peacock-Farrell’s first save as the pattern was quickly set with the hosts happy to play on the counter attack despite being at home. Peter Etebo was next to test the Leeds keeper and Peacock-Farrell did well to tip a free-kick over. Jack Clarke crossed for Alioski at the other end, but his touch was poor and Stoke were able to clear. Hernandez then saw a shot well saved by home keeper Jack Butland. Hernandez turned provider with a free-kick to the back post, but Jansson was unable to put his effort on target and the first half ended goalless. Stoke quickly took the lead after the break as Liam Cooper failed to clear the box with a header and Mateusz Klich only succeeded in directing the ball straight to Sam Clucas, who accepted the gift to shoot home. Tyler Roberts was brought on try to pep up Leeds’ attack and he almost made an immediate impact as his shot fell to Kemar Roofe, but the White top scorer was unable to make a clean contact with his effort. Stoke sub James McClean hit an effort wide for the hosts before Leeds were reduced to 10 men with Jansson’s controversial sending-off. Despite having 10 men United still tried to attack and Stoke defender Ryan Shawcross almost turned a dangerous cross into his own net. From the resulting corner Ayling forced former Leeds loanee Butland into a superb save after he met an Hernandez corner with a strong header. The home team doubled their lead in the 88th minute as Adam Forshaw was found ball watching as he allowed McClean’s low cross to be put in from close range by Allen. Leeds did finally score deep into injury-time when Hernandez’s corner cleared everybody, but was met by Alioski just inside the area and he hit a fine angled shot into the corner of the net. But it was too late to be anything other than a consolation. Despite the defeat Leeds still remain four points ahead of the team in third with Sheffield United also losing at Swansea. Stoke: Butland, Bauer, Allen, Williams, Etebo, Afobe, Martins Indi, Adam, Shawcross, Clucas, Campbell (McClean 67). Leeds: Peacock-Farrell, Ayling, Jansson (sent-off 76), Cooper, Alioski, Forshaw, Clarke, Klich (Stevens 76), Hernandez, Harrison (Roberts 61), Roofe.